One fun and unexpected benefit from crafting a cocktail each week has been the discovery of how versatile tequila is. I say with some confidence that before I started Friday Cocktails I only thought of tequila cocktails as either a margarita or a shot. Period. 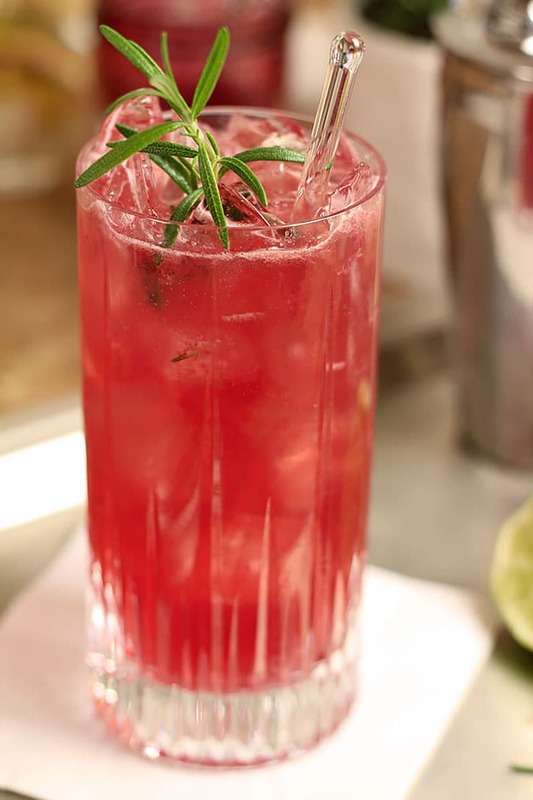 I’m so grateful for expanding my tequila horizons; this Rosemary Cherry Crush with Tequila and Cherry Preserves is SO delicious…I really have come a long way baby! I first published this cocktail several years ago and decided I should share it again after making it this week for friends who flipped for it. I’ve mixed tequila with sparkling wine, coffee and hot chocolate and loved all of them but for this cocktail today it’s added to a muddled mix of rosemary, lime and cherry preserves which is topped with some spicy ginger beer. Yes, I did say cherry preserves. Preserves are a wonderful and simple way to add some fruit to your cocktails and there’s nothing wrong with keeping it simple, right? Plus you can make this cocktail without regard to seasonal produce; I did not want to wait until May! I LOVE seasonal fruits in my adult beverages but I also love serving this drink over the holidays when there is nary a cherry in sight. Need more preserve inspiration? Check out another favorite, this Orange Marmalade Margarita and then go to town; almost any cocktail that calls for fresh fruit can be modified using preserves so that seasonal can’t stop you from having a favorite…cool right? 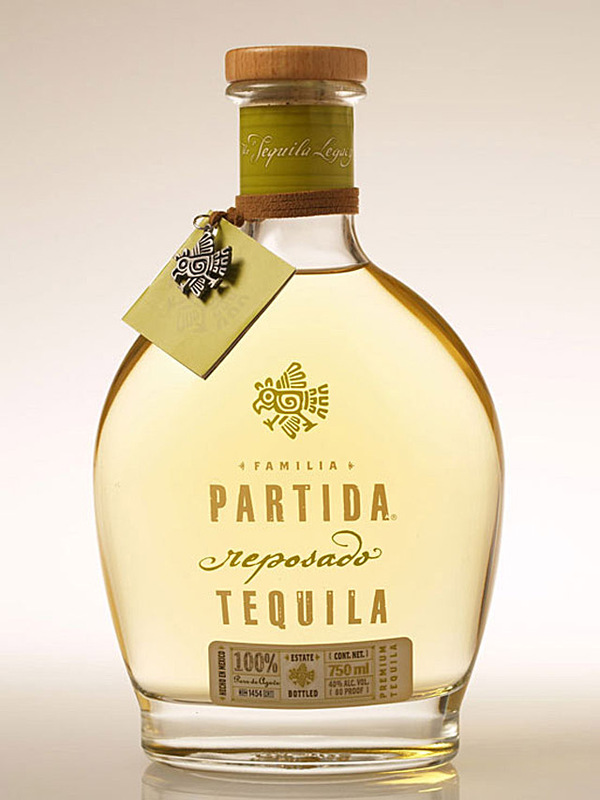 I was provided with a bottle of Partida Tequila which is available as an Anejo, Blanco or Reposado Tequila. Not only did I receive a sample box of all three but also a full bottle of he Reposado, my personal favorite. Smoother than the Anejo and sweeter than the Blanco, it was really easy to drink. Maybe I just have a prejudice for Reposado but this is both a nice sipping tequila and a great mixer. A nice slow heat when sipped, it added the perfect touch to this beautiful cocktail. Blue agave (Agave tequiliana Weber) is actually a member of the lily family, even though it looks like it must be related to the cactus. It’s grown in certain parts of Mexico and the plants—which can grow up to 15 feet tall—take 8 – 12 years to mature before they’re ripe for harvesting for tequila. To be considered a premium tequila like Partida, it must be made from 100% Blue Agave. Partida is also one of the few tequilas that qualifies as “estate grown” which means that the company owns all the land that their agave is grown on, best to assure both quality and consistency. I’ve received a fair number of tequila samples and I can honestly say this is one of my favorites. Sweet and tart with warmth from the tequila and spice from the ginger beer, this Rosemary Cherry Crush with Tequila and Cherry Preserves was one terrific cocktail. I can’t wait to serve it to guests again this evening. After the week I’ve had, tonight there will be no just taking a few sips, nope. I plan to drink the whole thing and maybe two…it’s really THAT good! Muddle the cherry preserves, rosemary and lime juice in a cocktail shaker. Add the tequila and 1 cup of ice and shake until the mixture is ice cold; approximately 20 times. Fill a highball glass with ice and strain the mixture into the glass. Finish off with ginger beer and garnish with a rosemary sprig. I received a bottle of Partida Tequila to review however all commentary is my own. wow, this is really….creative! Love the cherry preserves and rosemary, inspired! Also like tequila in this, very bold and atypical! It is a truly delicious cocktail; a great example of how tequila really is great in something other than a margarita too. Thanks Jennifer I’ll come check it out! I just tried this today and it’s delightful. Mine turned out a much paler shade of pink but the flavors are divine. Thank you for the recipe! I imagine different preserves might result in different shades but it’s the end result that counts…so glad you tried it because I just love it and glad you did too! Preserves and spices and beer and tequila! Everything certainly came together to make this one enticing looking cocktail. Glad to hear you drank the entire thing, after the week you had. Hugs and hope that your up for meeting the week ahead with all you’ve got. I first tried Partida at a local Newport Beach restaurant, SOL Cocina, that offers a huge selection of premium tequilas – it is excellent choice for this lovely cocktail! Add ginger beer, one of my favorite mixers, and cherry preserves and I’m loving this cocktail! Bring on the partida – I still have a tiny bottle we were given. Yay! 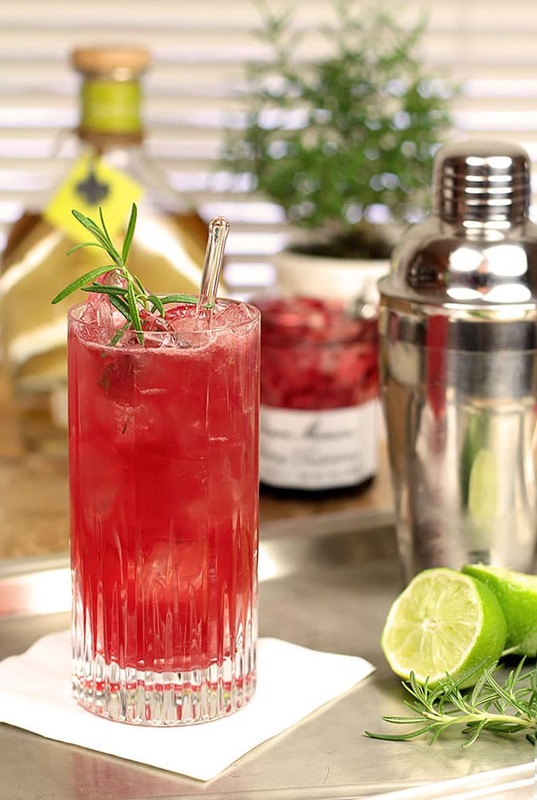 First of all – I love love LOVE Partida Tequila and this cocktail – oh my heavens I need to try it. The photos just pop off the screen. Looks refreshing! I would have to substitute out the rosemary because of an allergy but I think it would still be good. Fun drink! Preserves in cocktails is a fun idea! Really interesting combo of flavor – I’ll bet this tastes wonderful! And who can resist that red color? Good stuff – thanks. This is beautiful! And what an incredible combination..ginger beer, rosemary, tequila..some of my favorite things! 🙂 Can’t wait to try this one! I thought it sounded great and would look pretty; nothing I love more than having that be true! What a beautiful, refreshing looking cocktail for this Friday. I am on my way over.